On Dec 2, 2016, CDA Wildlife officials confiscated a seven-month-old bear cub that was apparently on sale at the National Science Fair. Among the 150 stalls set up at the fair, the pavilion of Dr Rana’s Clinic was the centre of attraction where the black bear cub was tied among other exhibits such as an Indian python and the corn snake. Soon, the news spread that the bear cub was on sale. “I was surprised to learn about the heinous act ” said Pakistan Science Foundation Chairman. According to Dr Bilal Rana, representing Dr Rana’s Clinic, the news about the sale of the bear cub was a misunderstanding. “The bear cub was on sale for Rs 330,000 was a slip of the tongue,” Dr Rana clarified. He said the cub belonged to one of the clients who owned exotic species and was brought to the fair as an exhibit. He said the cub was possibly captured from the wild, like most black bear cubs were. According to Dr Rana, the organisers had asked him and his team to wrap up his stall. However, when the Ministry of Climate Change voiced its concerns, the Islamabad Wildlife Administration took the bear cub into custody. Inspector General Forest Mehmood Nasir said the sale of endangered species was prohibited under the Pakistan Trade Control of Wild Fauna and Flora Act 2012. “This law aims to ensure that trade in wild animals will not lead to their extermination. Bears are top predators and symbolise a healthy ecosystem. If they vanish, the ecosystem will be impacted significantly,” said Mr Nasir. According to the official, bear cubs were stolen while the mother was in hibernation. “At least two bears are killed to capture one cub, mostly the cub’s mother and sometimes its aunt which protects the cub,” the official explained. 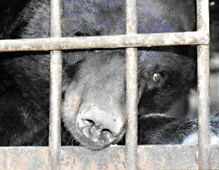 The unfortunate bear cub was kept in a tiny cage as can be seen from the attached photos; he was missing his mother, lonely and unhappy. Previous Previous post: Dogs Can Detect Malaria. How Useful Is That?